How old was I? Maybe twelve? I'm not sure. I remember bringing Klondike bars to this tiny little square with a small park area and eating the ice cream on the swings during the twilight hour. Chocolate-dipped ice cream, mild weather, and a quiet setting. Because I don't have Klondike bars all that often, this memory has remained one of my associations with them. 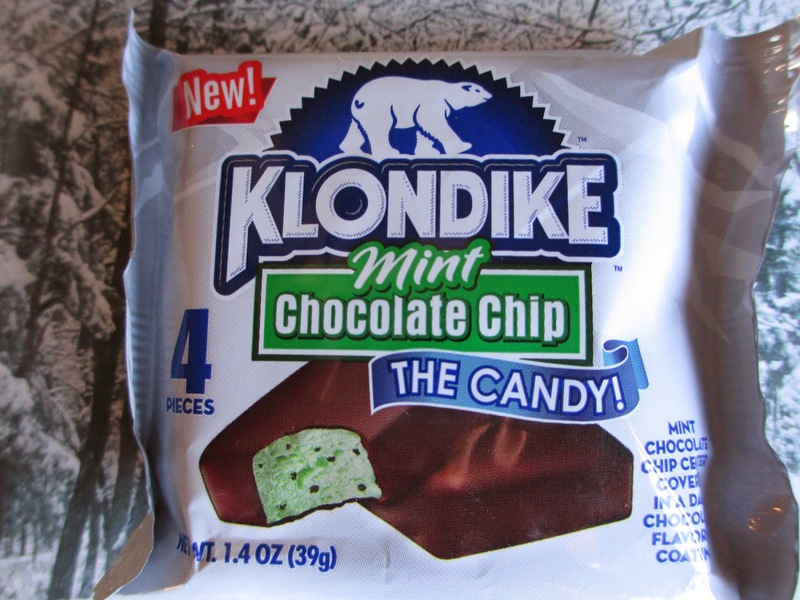 Now Klondike has paired with Flix Candy to make these candy versions of the ice cream. Thing is, I usually only have the plain, original flavor, and the candies come in Mint Chocolate Chip and Caramel. Mint Chocolate Chip sounded more like ice cream to me than Caramel, so I went with that. Opening up the wrapper, the chocolate smells suspiciously like York Peppermint Patties. Instead of being just one or two Klondike bar-shaped candies, there are four small squares, which further reinforces the peppermint patty comparison, even if they are squares instead of circles. I suppose it's also all similar to the ice cream truffles Godiva released a couple years ago. The chocolate coating is fairly thin, and it is suspicious (or is humorous the word?) because it is called a "dark chocolate flavored coating." Why use dark chocolate when you can flavor an oily goo with dark chocolate flavoring instead? The minty inside looks like the peanut butter center of a Reese's cup: they both have a dry, crumbly sort of look to them. But whatever it is made out of, it's designed to melt in your mouth, evoking melting ice cream. It's a rather nice effect. There is peppermint oil (really, artificial peppermint is pathetic), so there is a strong enough minty taste. It isn't wholly fresh, but I wasn't expecting it to be. Everything is all very sweet, as if this were an ice cream bar. I don't know if such a candy is worth the two dollars I got it for, but it's the concept that's fun. A Klondike bar that's a candy instead of an ice cream. Why not? At least it admits it's candy--and even admits that it doesn't have dark chocolate.